Spray of vintage blown glass clear red currants with 3 green fabric leaves. Each currant measures 1/4" across. Each leaf measures 1-1/4" long and 1" wide. 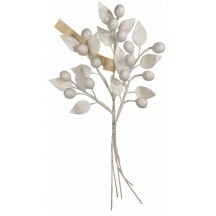 Overall spray measures 8-1/2" long and stems are green paper-covered wire. Most bunches have their original "Made in Germany" paper tags. Spray of vintage blown glass berries with green satin fabric leaves. 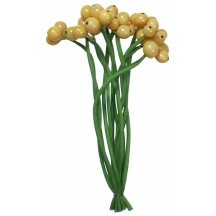 Largest glass berries measure 3/4" long and are clear green and brown ombre glass. Each leaf measures 3/4" long. Overall spray measures 10" long and stems are green paper-covered wire. Most bunches have their original "Made in Germany - Soviet Occupied" paper tags. 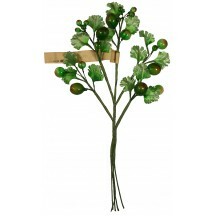 Spray of vintage blown glass fruit with green satin fabric leaves. 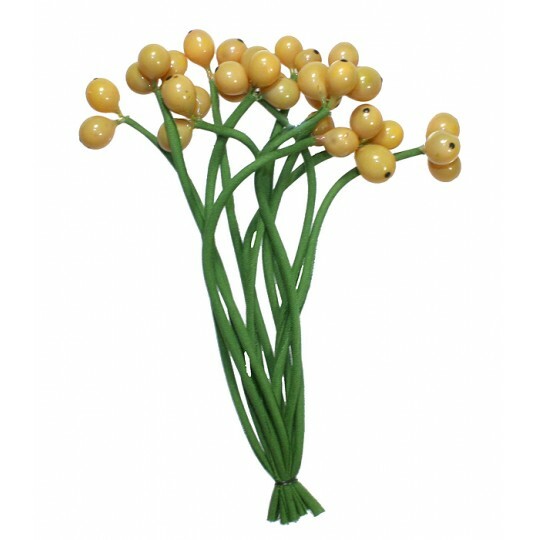 Each fruit measures 5/8" across and is made of green colored glass with an ombre fade. Each leaf measures 1" long and 3/4" wide. 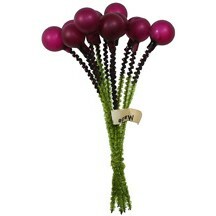 Overall spray measures 10" long and stems are green paper-covered wire. 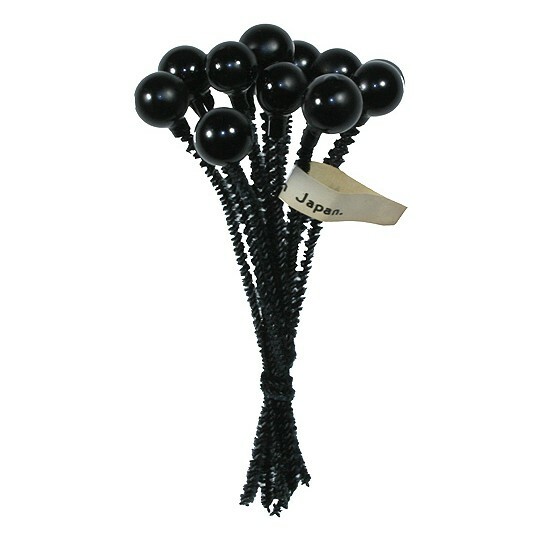 Most bunches have their original "Made in Germany" paper tags. 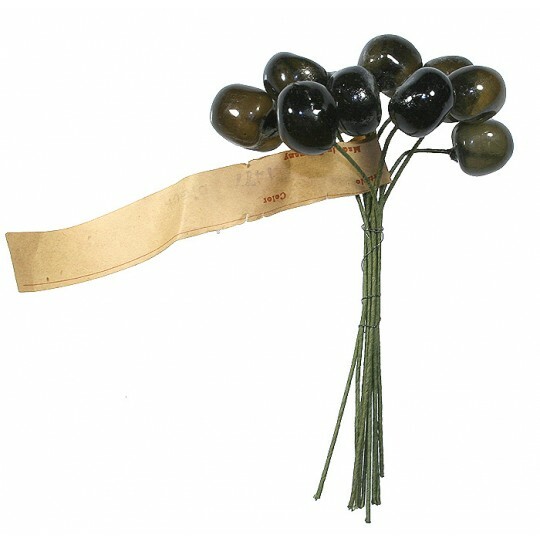 Spray of vintage blown glass fruit with green satin fabric leaves. Each fruit measures 5/8" across and are black, red and yellow-orange. Each leaf measures 1" long and 3/4" wide. 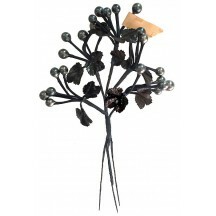 Overall spray measures 10" long and stems are green paper-covered wire. Most bunches have their original "Made in Germany" paper tags. 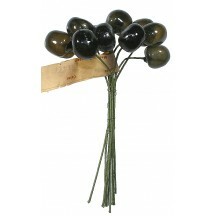 Spray of vintage blown glass cherries with green fabric leaves. 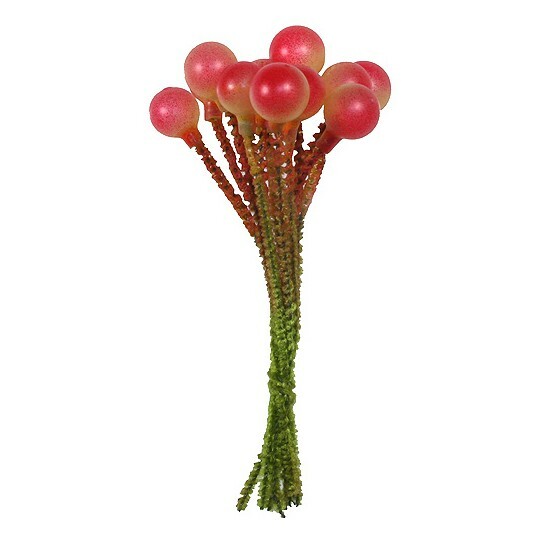 Each fruit measures 5/8" long and are clear red glass. Each leaf measures 1-1/4" long. Cherries have green rolled fabric stems that allow them to hang down. 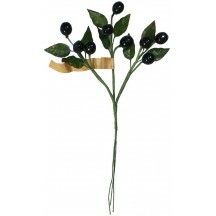 Overall spray measures 9" long and stems are green paper-covered wire. Most bunches have their original "Made in Germany" paper tags. Spray of vintage glass olives with green fabric leaves. 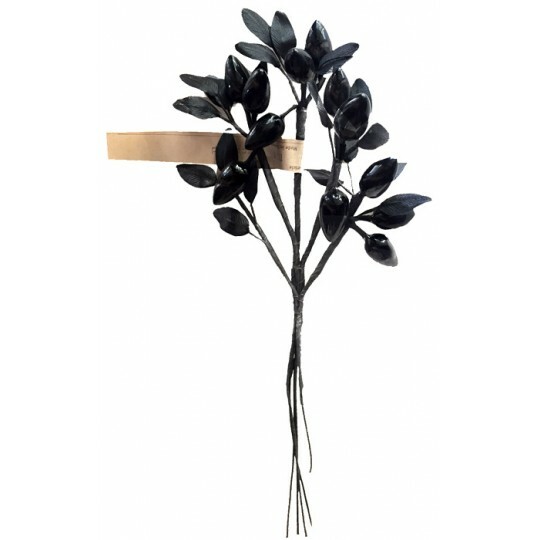 Each olive measures 3/4" long and a deep glossy black with light texture from the manufacturing process. Each leaf measures 1-1/4" long and 3/4" wide. Overall spray measures 10" long and stems are green paper-covered wire. Most bunches have their original "Made in Germany" paper tags. 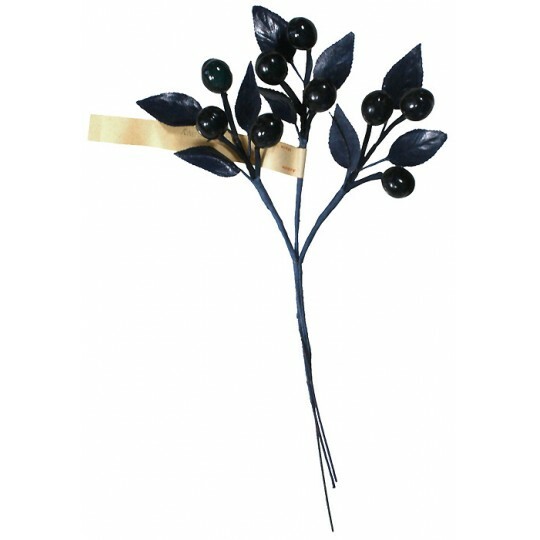 Spray of vintage navy glass olives with glossy navy blue fabric leaves. Each olive measures 3/4" long and a deep glossy navy blue with light texture from the manufacturing process. Each leaf measures 1-1/4" long and 3/4" wide. Overall spray measures 10" long and stems are navy paper-covered wire. 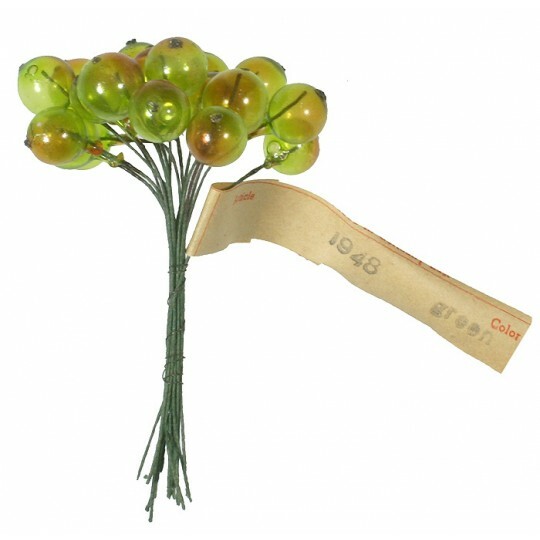 Most bunches have their original "Made in Germany" paper tags. Spray of leaves in off white with painted glass off white berries. Leaves measure 1-5/8" long by 3/4" wide. 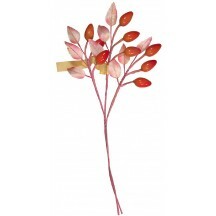 Spray measures approximately 11" long overall. Berries measure approximately 5/8" long and are glass painted off white. Some sprays have an attached paper tag that reads "Made in Germany". 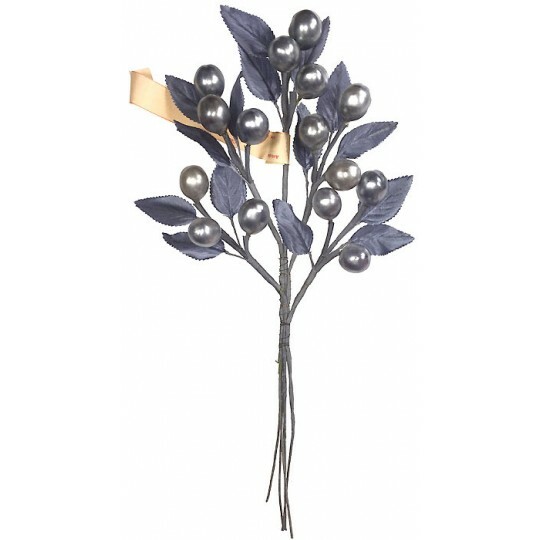 Vintage spray of dark silver pearlized berries and glossy dark navy leaves. Leaves measure 1" across and are a deep glossy navy color. 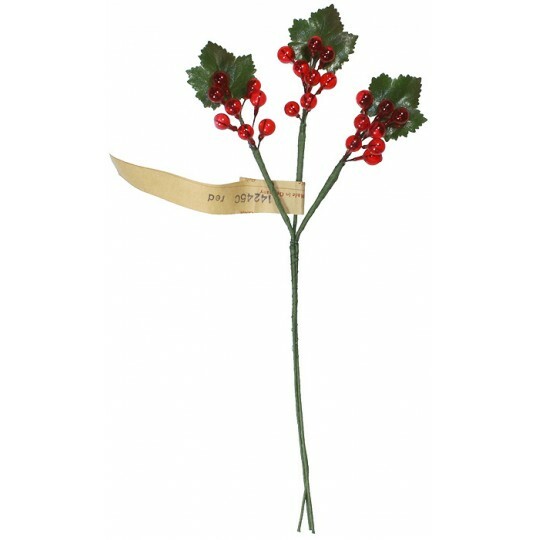 Spray measures approximately 7-1/2" long overall. Berries measure approximately 3/8" across. 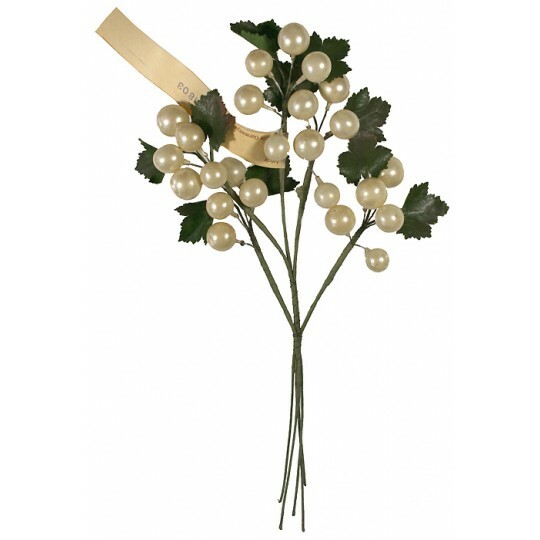 Some berries have crazing and light color loss from age, sprays are in vintage condition. Some sprays have an attached paper tag that reads "Made in Germany". 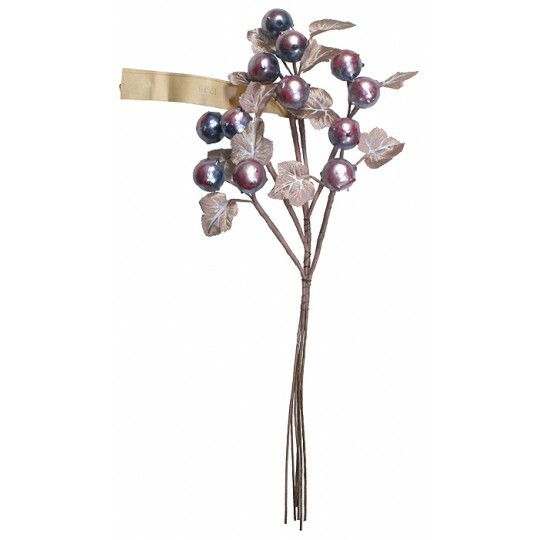 Vintage spray of silver pearlized berries and silver-grey leaves. 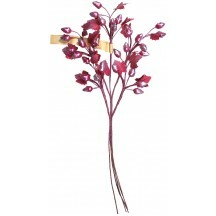 Spray measures approximately 10" long overall. Berries measure approximately 1/4" across. 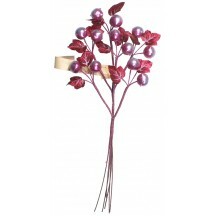 Some berries have crazing and light color loss from age, sprays are in vintage condition. Leaves are a mix of small individual leaves and 3-leaf clusters. Some sprays have an attached paper tag that reads "Made in Germany". 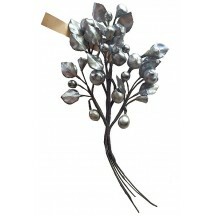 Spray of leaves in silver-grey with painted glass silver berries. Leaves measure 1-5/8" long by 3/4" wide. Spray measures approximately 11" long overall. 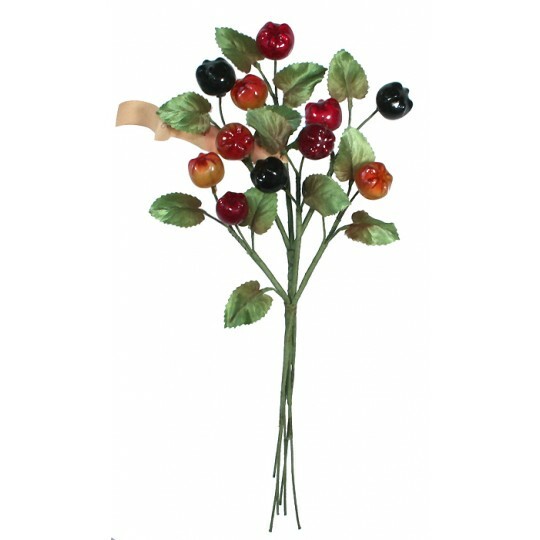 Berries measure approximately 5/8" long and are glass painted silver. Some sprays have an attached paper tag that reads "Made in Germany". 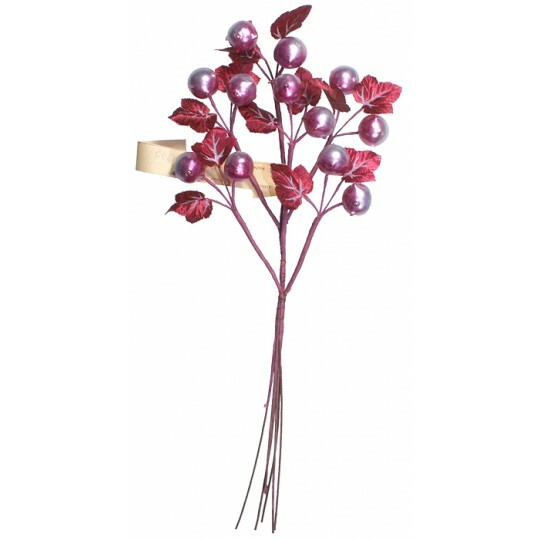 Vintage spray of silver pearlized berries and glossy handpainted pink and green leaves. 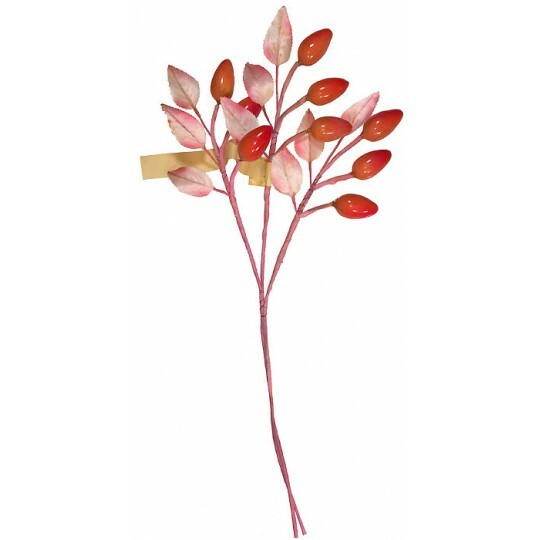 Largest leaves measure 1-1/4" long. 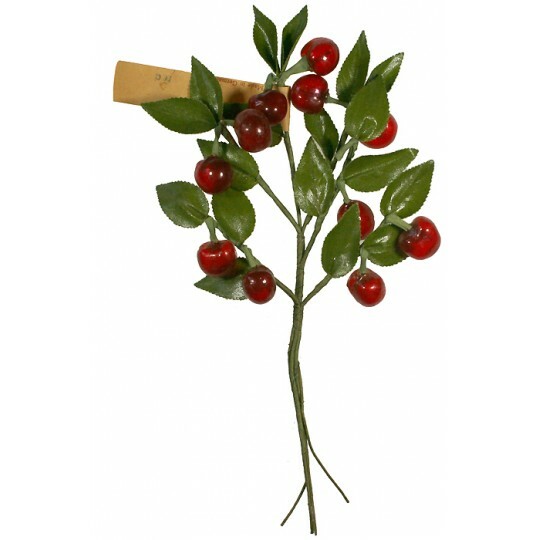 Spray measures approximately 9" long overall. Berries measure approximately 1/4" across. 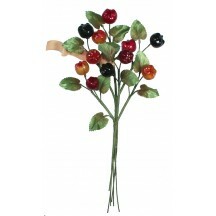 Many berries have crazing and color loss from age, sprays are in vintage condition. Some sprays have an attached paper tag that reads "Made in Germany". 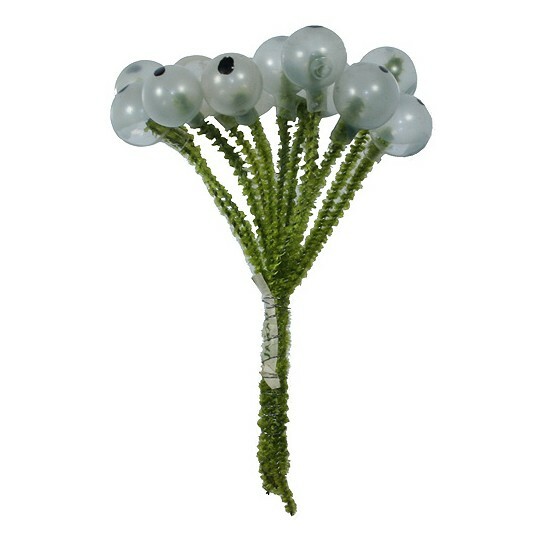 Bundle of 18 Vintage Glass Currant Berries in Green Ombre ~ 3/8"
Bunch of 18 old store stock vintage glass berries in green ombre with small dot accents like a real currant. Berries measures approx. 3/8" across though some are sligtly larger and smaller. Green paper-wrapped stems are wired and most bunches have their original "Made in Germany" paper tags. 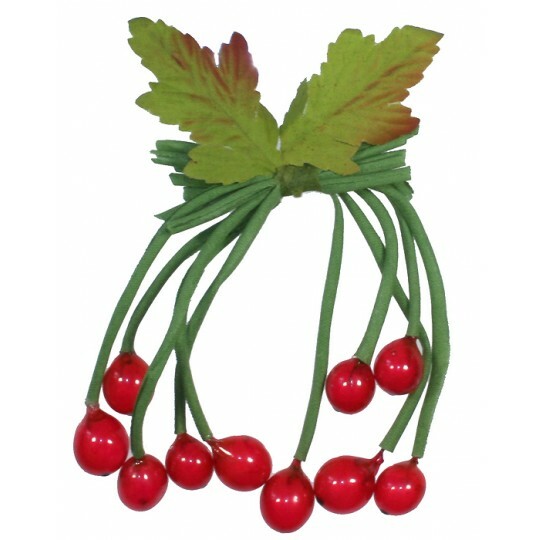 12 Vintage Glass Millinery Berries in Clear Red ~ 3/8"
12 old store stock vintage glass berries in clear red. Each measures 3/8" tall on a 2-1/2" green chenile stem. Most bunches have their original "Made in Japan" paper tags. 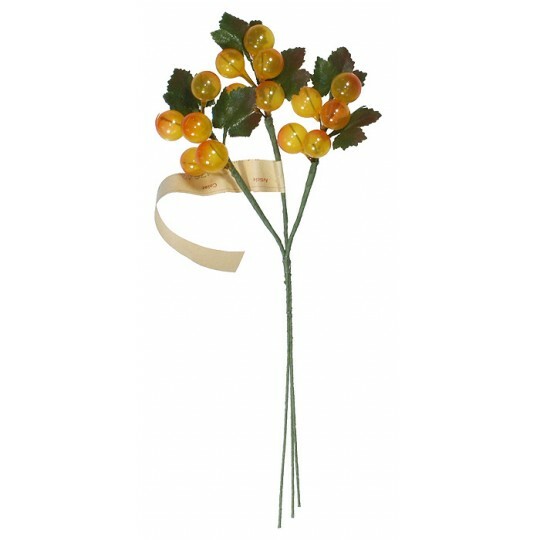 12 Vintage Glass Millinery Berries in Matte Orange Blush ~ 3/8"
12 old store stock vintage glass berries in matte yellow with orange accents . Each measures 3/8" tall on a 2-1/2" green chenile stem. Most bunches have their original "Made in Japan" paper tags. 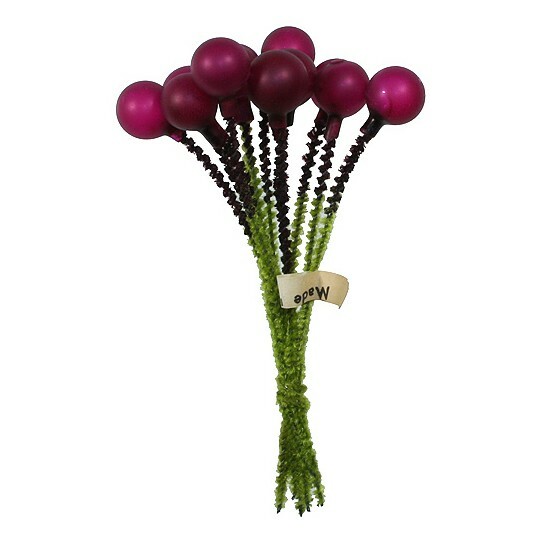 12 Vintage Glass Millinery Berries in Matte Magenta ~ 3/8"
12 old store stock vintage glass berries in matte magenta. Each measures 3/8" tall on a 2-1/2" green chenile stem. Most bunches have their original "Made in Japan" paper tags. 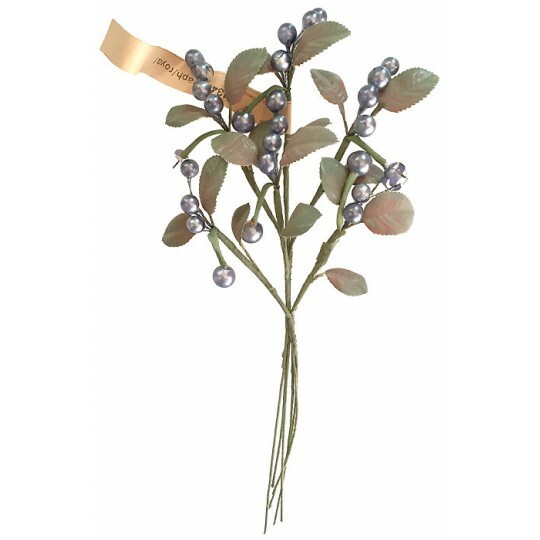 12 Vintage Glass Millinery Berries in Matte Palest Blue ~ 3/8"
12 old store stock vintage glass berries in matte palest blue, each with one black dot for a berry look. Each measures 3/8" tall on a 2-1/2" green chenile stem. Most bunches have their original "Made in Japan" paper tags. Some berries have subtle color loss that does not detract. 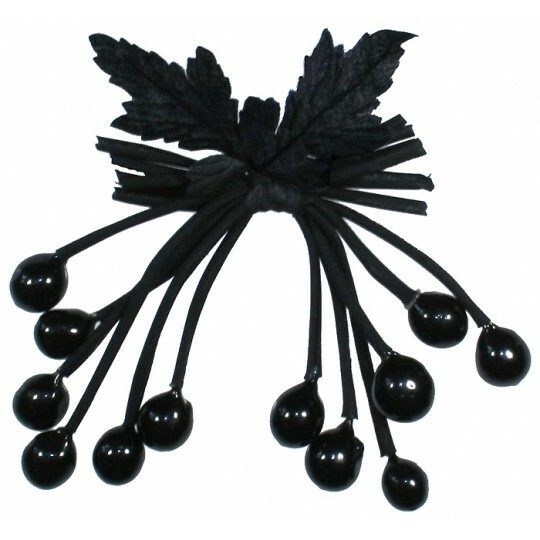 12 Vintage Glass Millinery Berries in Black ~ 3/8"
12 old store stock vintage glass berries in black. 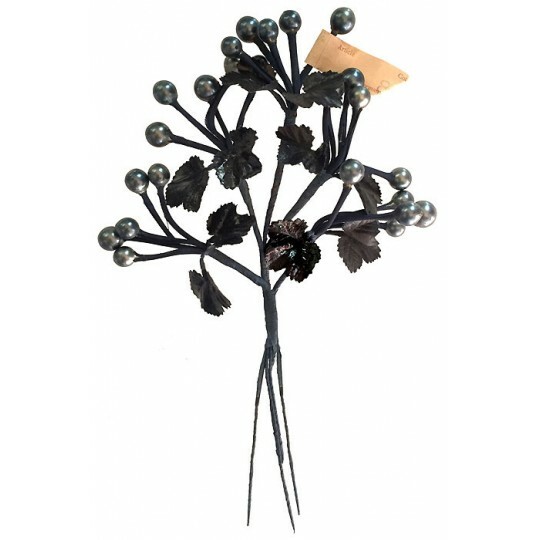 Each measures 3/8" tall on a 2-1/2" black chenile stem. Most bunches have their original "Made in Japan" paper tags. 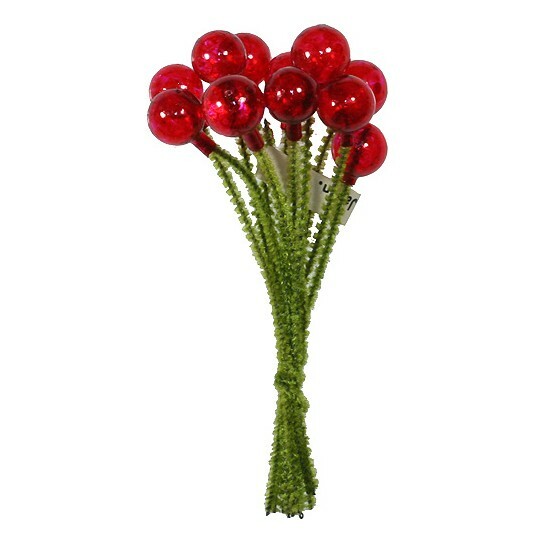 Spray of 10 old store stock vintage glass berries in clear red. Berries measures approx. 1/4" across though some are a bit larger and smaller. 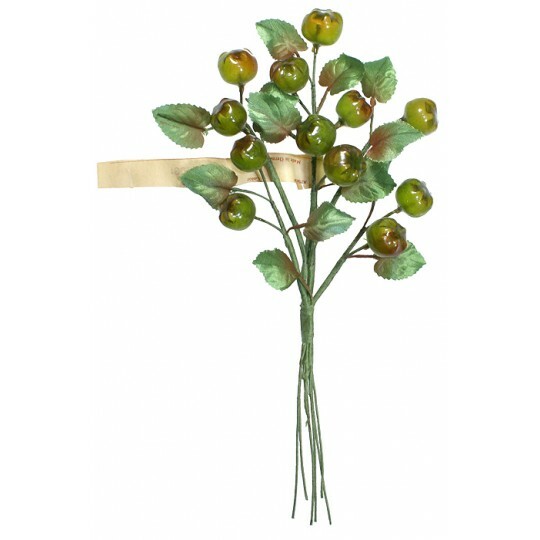 Green rolled fabric stems are not wired and the bundle has 2 green ombre fabric leaves. 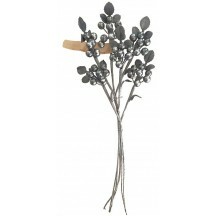 Bunch is approximately 4-1/2" long and 4" wide. Some bunches have their original "Made in Germany" paper tags. 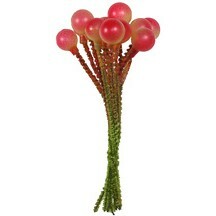 Spray of 12 old store stock vintage glass berries in a mix of red, brown and yellow. Berries measures approx. 1/4" across though red berries are a bit smaller. 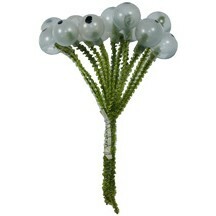 Green rolled fabric stems are not wired and the bundle has 2 green fabric leaves. Bunch is approximately 4-1/2" long and 4" wide. Some bunches have their original "Made in Germany" paper tags. Spray of 12 old store stock vintage glass berries in milky orange. Berries measures approx. 1/4" across though some are a bit larger and smaller. 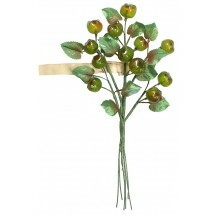 Green rolled fabric stems are not wired and the bundle has 2 green ombre fabric leaves. 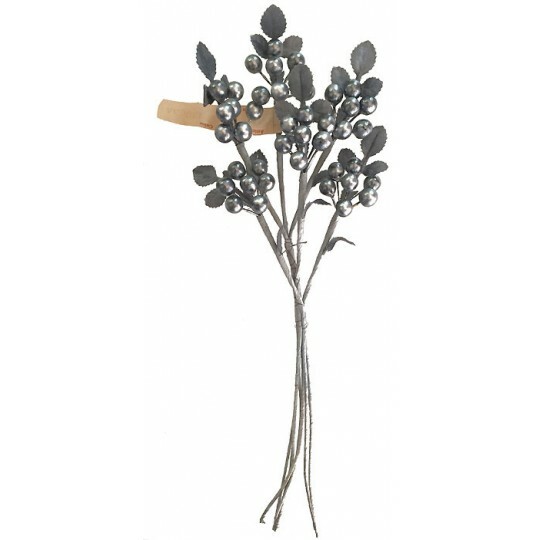 Bunch is approximately 4-1/2" long and 4" wide. Some bunches have their original "Made in Germany" paper tags. 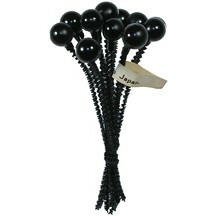 Spray of 12 old store stock vintage glass berries in opaque black. Berries measures approx. 1/4" across though some are a bit larger and smaller. Black rolled fabric stems are not wired and the bundle has 2 black fabric leaves. Bunch is approximately 4-1/2" long and 4" wide. Some bunches have their original "Made in Germany" paper tags. 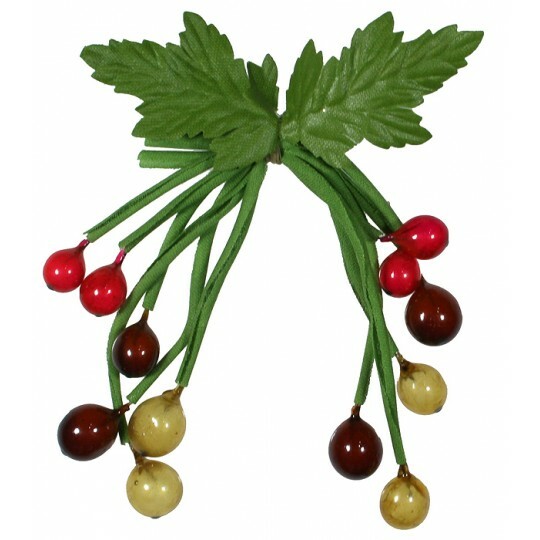 10 Vintage Glass Millinery Cherries in Deep Brown ~ 5/8"
12 old store stock vintage glass cherries in deep brown. Each measures 5/8" tall on a 3-3/4" green paper covered wire stem. 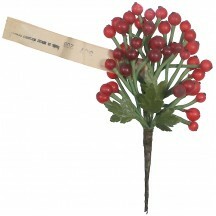 Most bunches have their original "Made in Germany" paper tags. The glass is semi-textured in places from the manufacturing process that only adds to their vintage charm. 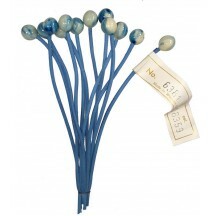 Vintage bundle of 12 stems with marbeled blue glass currants. Currants measures approx. 1/2" long. 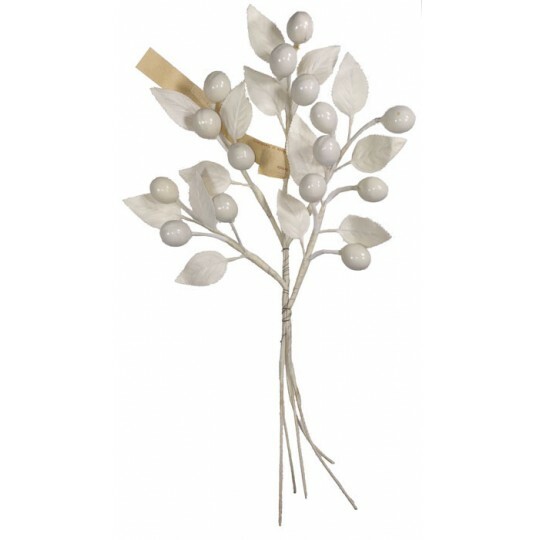 The blue rolled fabric stems are not wired -- they are pliable and easily drape. Bunch is approximately 5-1/2" long. Some bunches have their original "Made in Western Germany" paper tags. 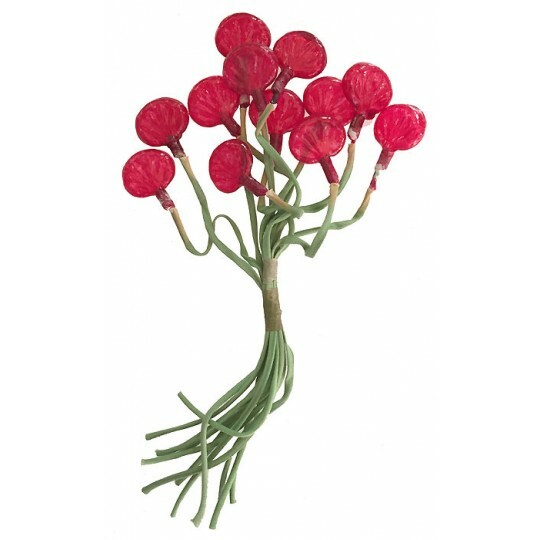 Vintage bundle of 12 stems with clear red glass fruit. Fruit measures approx. 3/4" long x 1" across and 3/8" thick. 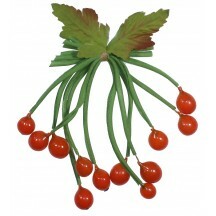 The green rolled fabric stems are not wired -- they are pliable and curled. Bunch is approximately 8" long. Some bunches have their original "Made in Germany" paper tags. 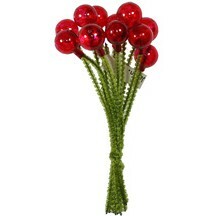 Bunch of old store stock vintage glass berries in frosted red, each with one textured dot for a berry look. Berries measures approx. 1/4" across though some are slightly larger and smaller. 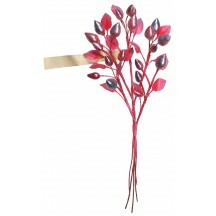 Green rolled fabric stems are wired and the bundle has 4 small fabric leaves. Most bunches have their original "Made in Germany -- Soviet Occupied" paper tags.